1 What are Metatarsal Pads? 1.1 How to use metatarsal pads? Metatarsal pads are used to get rid of pain such as Blisters, Bunions, Broken Metatarsals, Corns, Calluses, Healing Fractures, Morton’s Neuroma, Metatarsalgia, Sesamoiditis, Generic Foot Pain or Post Surgery. Metatarsal pads are made of super-absorbent gel to cushion your feet.it is designed to remove and relax pressure area, so that you can walk freely and comfortably all day long. The gel cushioning is made to fit different sizes, even wider than the average feet. How to use metatarsal pads? Many people actually don’t use them properly and end up aching foot more. It’s important to place the pad in a correct position. People have a misconception that it should be placed on the actual ball of the foot as that is where the exact pain you have. When you are using a met pad, press it on just beneath your toes at the base of your foot. You have done it right if you find the complete arch elevated with the pad in the metatarsal area. You’ll be able to remove pressure as the toes will fall down when once the metatarsal arch of one’s feet is raised. Now when you walk around, the metatarsal pad will make your toes downwards helping to reduce pain on your foot. Dr. Frederick’s Original Metatarsal Pads are best-selling which provide more comfort, very efficient and best for walkers, runners, and hikers. 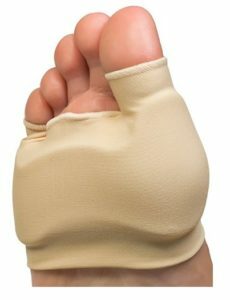 These feet relieving pads are made of stretching gel material that delivers superior cushioning that measure 5” x 7” x 1”, and the stretchable gel spreads to fit even the widest feet. A happy user commented that the pads are much more comfortable than expected and no issues with regular usage. However, few buyers are not satisfied with its pain relief. On the other hand, some customers are happy with the efficiency and expediency of Dr. Frederick’s metatarsal pads. A purchaser clarified that at first look, these foot pads look thin and flimsy, but they provide satisfactory cushioning. They also add that they can wear metatarsal pads with their walking shoes for a long time and tremendous for relieving pain in the ball of the foot. Overall, Dr. Frederick’s metatarsal pads are a great choice for blister, metatarsalgia, and calluses. We highly recommend them. Metatarsal Cushion by HappyFeet is one of the popular ones that are easy-to-use, durable and compatible with all footwear. These gel cushions are odorless that won’t stick or get dirty like other pads. They are self – adhesive, so that helps for easy application and at the same time can use them again and again. These gel cushions have no any kind of skin reaction and also the manufacturer offers a money back guarantee claiming exceptional solution for your aching heels with 100% satisfaction guarantee. However, few criticize for being so thin and doesn’t offer any comfort. Generally, Customer says it easily fits their heels and shoes securely. They also recommend these pads for people who are looking for the best metatarsal pads. A happy consumer says he is using these metatarsal cushions for years and still satisfied with its all-day performance in spite of working actively. Additionally, the customer also shares that with these pads the can walk around without feeling any pain. The Dr. Jill Felt Metatarsal Pads provide efficient cushion padding with ¼-inch thickness and weight 1.6 ounces. 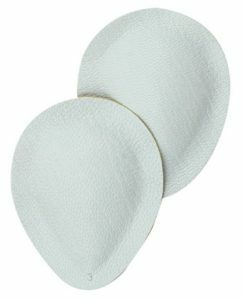 These pads are durable and measure 2.25” x 2.75”. The package contains ten pieces pad, so this is a perfect option for someone who is looking low-cost metatarsal cushions. These wide base metatarsal pads lessen pressures across the ball of your foot and have a self-sticking back to prevent sliding inside your footwear. The cushioning foot pads remove the pain in the foot and they are very comfortable to wear. People owning these pads are satisfied with its result and they highly recommend them. The user also claims that one can trim these pads to make it available for you and can easily stick them in your shoes without any issues. However, few customer complaints that they had to keep a check on washing their feet often as it’s too sticky. Final verdict, customer love these pads for being budget buy and say that these are the best metatarsal pads that they have ever owned and they ordered several extra packages. The NatraCure Gel Metatarsal Sleeves by PolyGel are flexible, durable and reusable. It helps to get rid of burning and pressure from the ball of the foot by sorting your weight over extra-soft gel pad. It comes with superior shock absorption for walking, running, or excessive standing. These pads are washable so when you find it dirty, you can wash them easily. The gel cushions are suitable for shoes and boots and can fit men’s shoe size 9.5 + and women’s shoe size 11.5 +. However, users find it little smaller than they expected. The drop pads are self-adhesive intended for easy use and hassle-free from sliding. However, few customers say it doesn’t come with an instruction about where to place the pads. Overall, Buyers have a positive review of the Pedag metatarsal arch pads, and they are satisfied with its usefulness that deals extremely well with the foot pain. We hope, you made your final decision to buy the one from The 5 Best Metatarsal Pads Reviewed. According to the survey, most purchasers experienced intense pain relief from the metatarsal pads. They love the fact that it’s reusable, versatile and comfortable.